Arktinen hysteria (”Arctic hysteria”). A play by Juha-Pekka Hotinen and Atro Kahiluoto based on Marko Tapio’s novel. Dramaturge: Aina Bergroth. 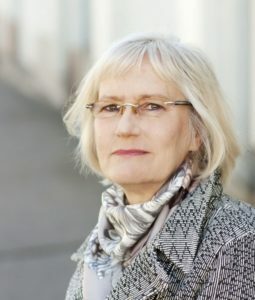 Director: Atro Kahiluoto. 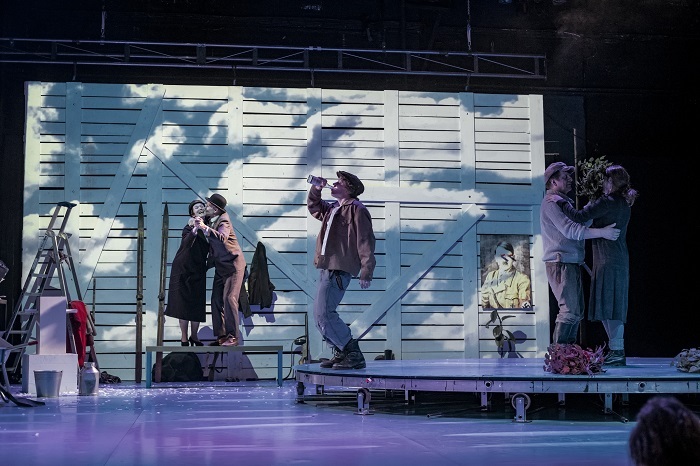 Scenography, projections and costumes: Reija Hirvikoski. Lighting designer: Ville Virtanen. Sound designer: Juhani Liimatainen. 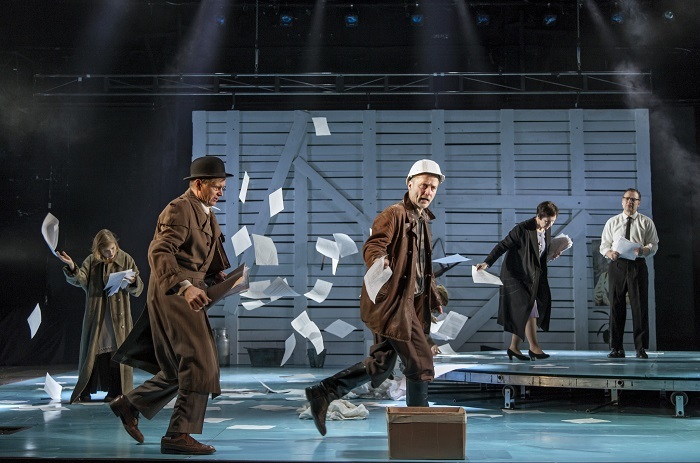 Premiered on the Small stage of the National Theatre, Helsinki, March 1, 2017. What sort of connotations may the term Arctic hysteria invoke in people? It seems to be familiar to many Finns, probably evoking associations with the word kaamos, the polar night—the period of darkness north of the Arctic Circle, when the sun does not rise over the horizon. In northernmost Finnish Lapland, kaamos, starting in late November, lasts more than seven weeks. I was unaware of all this at the premiere of Arktinen hysteria in the National Theatre, in March. What I did know was that the title was given by Marko Tapio (1924–1973) to his novel of two volumes, published in 1967 and 1968. Tapio died of alcoholism, and only drafts and fragments for the final two volumes remain in the archives. The novel has not enjoyed great popularity—Tapio was not an author of traditional, realistic prose, clear-cut characters, historical credibility, or linear narrative. His approach was ambitious, capricious, complicated and fragmentary—perhaps it could be characterised as pre-postmodern. Tapio’s contemporary, Väinö Linna (1920–1992) wrote solid, realistic and popular fiction; his sociohistorical novel trilogy, Täällä Pohjantähden alla / Under the North Star (1959–1962), became an enormous steady-seller, and has also been adapted to stage, film and television. It presents the reader with a family story, with a view of the losers of the Civil War (1918), the “Reds,” and with a portrait of a nation slowly taking form and recovering from the wars. Arktinen hysteria now takes place on stage for the first time; the writer, dramaturge and former theatre critic Juha-Pekka Hotinen (http://www.critical-stages.org/10/give-advice-be-a-political-journalist-%e2%94%81-interview-with-finnish-dramaturge-juha-pekka-hotinen/) already became interested in the author and his works in the 1980s, and together with his co-writer, the director Atro Kahiluoto, he has explored the fragmentary manuscript material by Marko Tapio in the archives of the Finnish Literature Society in composing the play text. The first scene shows a power station construction site in 1960. The protagonist, the foreman and engineer Harry Björkharry (Timo Tuominen), addresses the audience as the narrator of the events: the actual moment is critical, as there seems to be a leak in the dam holding back the lake water, and the workers are on strike because they have not been paid on time. He decides to make a phone call to his wealthy mother in Helsinki and to ask for the money to pay the workers, in attempt to prevent impending catastrophy. The twenty minutes he will have to wait for the call to be connected become a time frame in which the narrative starts oscillating between the present and the past, portraying the poor, rural life of Harry’s grandparents (Timo Torikka, Annika Poijärvi), events of the Civil War and the gradually urbanizing and industrializing society, in which Harry’s parents (Taisto Reimaluoto, Tarja Heinula) succeed in acquiring wealth and status. Through Harry’s eyes, we witness turns in the lives of fathers and sons, villagers and workers, lovers and relatives, the love-hate drama of a family, manifestations of class war and acts of violence evoked by the circumstances of the Civil War. “Only interlacing incidents and actions exist, and so do actions unperformed, and everything that has once happened is continuously present,” says Harry, repeating the observation in the course of the performance. The sins of the parents cast shadows into the present: revenge and hatred are not buried and forgotten by the following generations. Not ever? 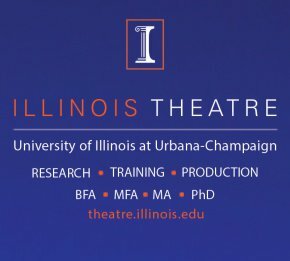 The ensemble of eight actors move around fast, changing costumes in their more than twenty roles. A small revolving platform on the right keeps changing place, time and characters. Among the props are buckets and axes, knives and booze bottles, long wooden skis, a dead pike—an ironic selection of folksy paraphernalia. The actors are quick and precise, interpreting the wide scale of emotions of the characters, both comic and tragic, and the temporal oscillations of the action stays lively. It remains unknown how Tapio would have ended his narrative. In this interpretation, the ensemble arrives on the stage with the author himself (Petri Liski), who joins his characters. Pages of the drafts are scattered on the stage, suggesting possible solutions. 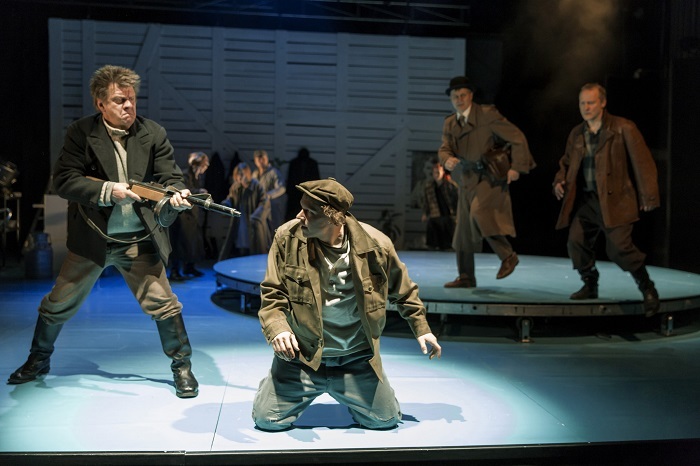 Will the workers get back to work or will Harry dare grab his father’s submachine gun, hidden in wartime? Will his beloved, Katja (Marja Salo), die accidentally? Will the dam burst and destroy the environment? 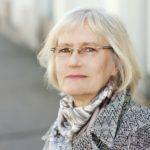 *Soila Lehtonen is a journalist and theatre critic, and the former Editor-in-Chief of the online literary journal Books from Finland (www.booksfromfinland.fi). 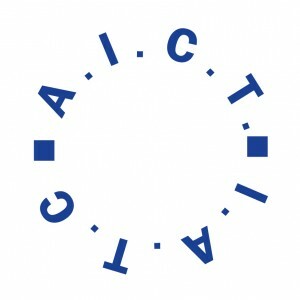 She is a Honorary Vice-President of IATC-AICT.